The watch is awesome. It was a gift for my daughter and she loves it very much. She loves the rose color and have been getting a lot of compliments. Adorn your wrist with this functional and elegant Cecile stainless steel chronograph watch from Fossil. Featuring a rose goldtone case, dial and bracelet, this watch keeps you on time with a warm, radiant style. Luminescent hands and Roman numeral markers echo the rose color, creating a polished and refined look. Featuring stainless steel construction for durability, this stunning watch is water-resistant to 330 feet, allowing you to wear it while swimming and showering. Quartz movement provides accurate timekeeping, and three sub-dials on the face display the day, date and 24-hour time for quick and easy reference. A push-button clasp secures the bracelet to your wrist for comfortable wear all day. Gorgeous watch. 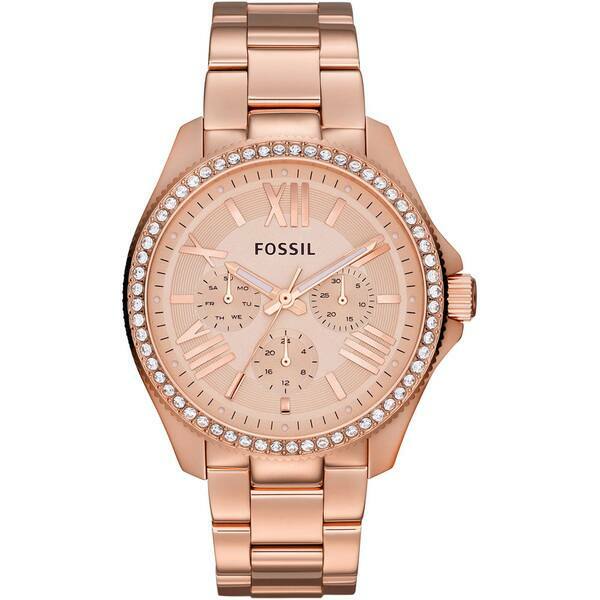 I've been looking for a rose gold-tone watch for months and I'm happy I decided on the Fossil's Cecile watch. It's beautiful and everything I wanted and expected. Color is great and quality is good. I LOVE MY WATCH!!!!! It’s beautiful it’s heavy and it’s a gem from Fossil. I love the rose Gold it’s gorgeous & I get a ton of compliments about!! I highly recommend this Fossil watch you’ll absolutely love it too!!!! beautiful style and durability. I always get compliments when I wear it. unfortunately, some of the rose color seems to be fading after 4 years of wear, but I still love it! Bought this as a gift for a friend and she absolutely loved it!! The color and style is true to the picture and the dial is medium sized. Very fashionable. I love this watch! I love that the numbers glow. After the second time they got my order right, and then still overstock still took money out of my account when I had sent the other one back even after they had it in their possession, I did get my money back within three days, was happy I got my money back , but I feel like they need to keep better track on packages that are being returned so the fact that no one should pay for an order twice when you get emails that say they have received the returned package. I bought this Fossil watch to give as a gift. It was better then I expected, it has a nice weight to it and the rose gold looks really nice. They loved it. I got a lot of compliments on this watch! Much larger than I expected. The band needed to be adjusted by a few links to fit. The size of the face is great for those of us with aging eyes. It is a high quality, yet trendy watch and I enjoy wearing it on occasion. Arrived not working. Wasted time going on-line trying to figure out what I needed to do to get the watch working. I turned the crown many times as instructed without results, and ended up with sore fingers and frustration. In the end was told sometimes they're just broken. The picture does not do this justice. I purchased this for a gift &amp; my niece was tickled to death! "I really want this but the roman numeral 4 is incorrect and that would drive me crazy! Does it really look like that?" Hello equit8, per my research, the Roman numeral four began to be commonly displayed on clocks as IIII, because they were built for the public, and they wanted the uneducated masses of that era to be able to read it. Over time, this incorrect way of displaying the Roman numeral four (IIII instead of IV), became common usage for clocks and watches, and still persists today. I hope this information is helpful. Thank you for shopping with us!